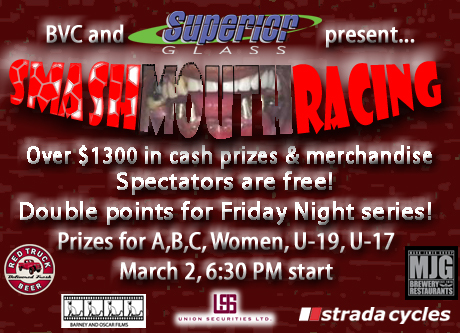 Smashmouth Racing presented by the Burnaby Velodrome Club and Superior Glass would like to announce additional prize money and prizes to the Friday, March 2nd race. Through their generous sponsorship there will be a Steve Engh-Union Securities $100 fastest lap, Barny and Oscar Films will put up $100 for the most aggressive rider over all categories, and there will be $200 in restaurant gift certificates from the Mark James Group as well as hoodies from Trek Red Truck Racing. Adding these sponsors to title sponsor Superior Glass and Strada Cycles brings the combined cash and prize purse to over $2000. On Friday, March 2nd, come out and watch some exceptionally fast and aggressive racing. In addition, registered massage therapist Mike Charuk, who has worked with Canadian Olympians Gina Grain and Zach Bell, will be on hand to offer massage by donation. Racing will be for all categories and starts at 6:30 pm. Spectators are free. Full details can be found at www.burnabyvelodrome.ca.